Graceful, vibrant, and hardy to the northern reaches of zone 6, the wild Byzantine gladiolus is one of the most exciting plants we’ve ever grown here at Old House Gardens. Yet finding true stock today is all but impossible. Though many sources offer it, what you’ll get 99% of the time instead is some inferior impostor, usually a pale, wimpy dud that’s not even close to exciting. (See our comparison photo below.) So we’ve been on a mission to expose this botanical identity theft, and to bring the true, fabulous, perennial Byzantine glad back into gardens across the country. What’s So Fabulous About It? Gladiolus byzantinus (or more properly Gladiolus communis subsp. byzantinus) is definitely NOT your ordinary glad. Instead of an over-blown modern extravaganza, it’s a graceful wildflower. With small, elegant blooms of vibrant cerise (or, as Felder Rushing admiringly calls it, “shocking magenta”), it looks more like an orchid than a glad. Surprisingly hardy, it has survived nine of the past ten winters in our gardens here in Ann Arbor, at the top of zone 6. It never needs staking, and it increases year after year into ever-larger and more beautiful clumps, as any good perennial should. 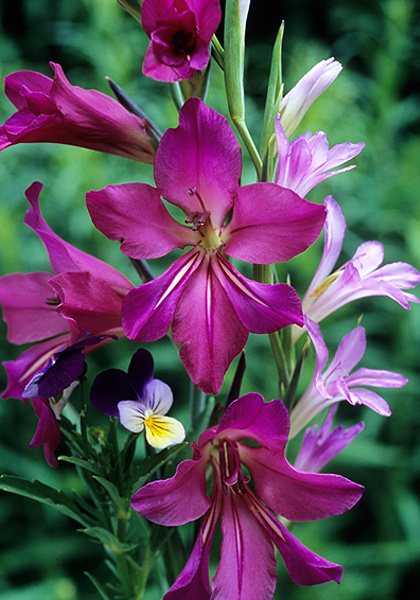 Though best known in the South where it’s a cherished passalong plant, Gladiolus byzantinus thrives today for our customers in 39 states, from coastal Maine to southern California. Christopher Lloyd loved it, Allan Armitage praises it, and it grows today at public gardens as diverse as Colonial Williamsburg and the Denver Botanic Garden. It’s tough and easy, doing best in full sun and well-drained soil, though in dryer areas it also thrives in heavy clay. The corms are smaller than those of modern glads, and they’re planted in the fall. Narrow foliage emerges in the spring and even in bud the plant is beautiful, with wiry, arching stems and 10-12 dark, pointed buds that jut forward eagerly. The flowers open in earliest summer along with roses, iris, peonies, and many other traditional perennials. Shortly after flowering the leaves wither as the bulbs go dormant for the summer. Though they might prefer the dry soils of their native Turkey during their summer rest, Byzantine glads handle the well-watered soils of most US gardens with ease. Unfortunately, Byzantine glads haven’t fared as well in the nursery trade. Today even reputable sources usually deliver — often at enticingly low prices and illustrated by photos of the real thing — less desirable impostors. Sometimes it’s the equally brilliant but much smaller-flowered and less enduring G. illyricus or G. italicus (formerly G. segetum), but most often it’s a wan, pinkish glad that some authorities identify as the very closely related G. communis subsp. communis. That’s the pale little flower on the right in our photo, above. The two look so different, it’s tempting to believe that botanists are confused about their relationship, but what gardeners really want to know is: Why is this impostor almost always sent in place of what they really want? Most likely it’s because it can be quickly and cheaply propagated by seed whereas the true G. byzantinus rarely if ever sets seed and has to be multiplied by offsets, a process that is slower and much more expensive for commercial growers. The good news is that price provides an excellent guide to the real thing. If a source offers G. byzantinus for very little — or a Rolex for $20 — there’s virtually no chance you’ll actually get what you want. Of course gardeners are optimists, and many continue to fall for the irresistibly cheap impostors. (Read the confession of one of our own crew members.) But we’re convinced that — if gardeners knew the truth — instead of spending $4.95 here and there, year after year, for a dozen runty impostors that never amount to anything, they’d much rather invest $12.50 in a tough, graceful, gorgeous perennial glad that just gets bigger and more amazing every year. If they knew the truth. 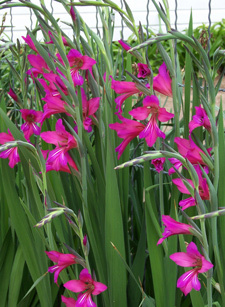 And that’s why we’ve named the true Gladiolus byzantinus our 2006 Fall-Planted Heirloom Bulb of the Year. “G. byzantinus is alive and well in Ireland. I saw them blooming proudly in Helen Dillon’s garden, Glasnevin Botanical Garden, Powerscourt, Muckross Castle, and along the way in cottage gardens. 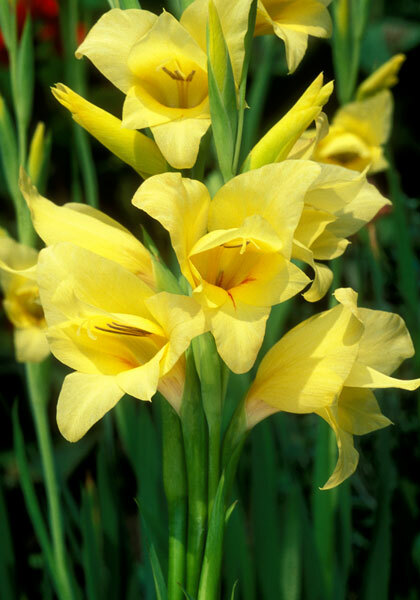 For the other graceful, wildflowery glads we offer, including our 2008 Spring-Planted Bulb of the Year, ‘Carolina Primrose’, enter “small-flowered glads” and “species glads” in our Search box. 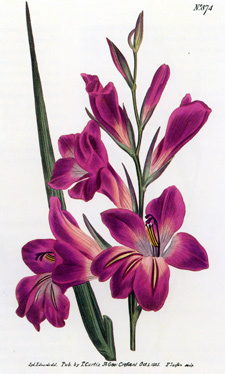 And to learn more, read “Glads for Glad Haters” by Scott Kunst, owner of Old House Gardens, in Plants & Garden News, Brooklyn Botanic Garden, Spring 2006.